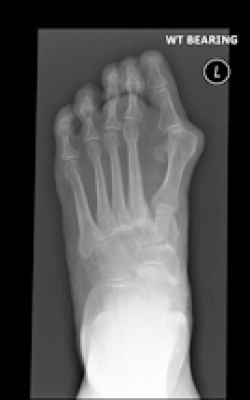 Metatarsalgia is a term used to describe pain in the metatarsals. These are the bones connected to the little bones in your toes. They lie just before the web between the toes begins. If the body weight is not distributed in a normal manner through the foot, then an abnormally large proportion of the weight may be passed through the lesser rays. This high pressure can cause hardness of the skin and pain. Patients describe this as walking on marbles or having a stone in their shoe. The high pressure can also be caused if the lesser toes are a lot longer than the big toe. The toes can claw and push down on the metatarsal. This often happens when there is a bunion This can also occur after surgery on the big toe if the big toe is shortened significantly by the surgery. There are other causes for pain in the forefoot. It requires appropriate examination and tests to find out which cause is responsible for the foot pain. If you have forefoot pain, it is best to see an orthopaedic surgeon who specialises in foot and ankle surgery. You should have x-rays taken in a standing position – this is when the deformity is worst. It is also the position that your foot adopts in your shoe. There are many operations that can be performed for metatarsalgia. The exact combination of procedures depends on what is the root cause of the pain. Often there is a bunion associated with metatarsalgia. Correction of the bunion can allow better weight bearing through the big toe. This surgery can be reviewed by clicking here. If there is hard skin in the sole of the foot associated with pain on weight bearing, then surgery can relieve the high pressure that causes both. The same result can sometimes be achieved by an insole, and this is often tried first. However, some people will need surgery if their insole does not relieve their pain, or the insole itself prevents shoes from fitting. Most operations involve breaking a bone and resetting it to decrease the proportion of the body weight passing through that ray of the foot. These operations include Weil’s osteotomy, the BRT osteotomy and the OCRA (osteotomie cervicale de raccourcissement axial) osteotomy. 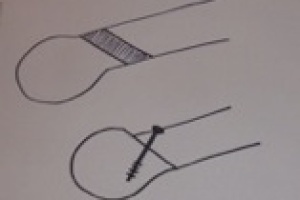 The resetting of the bone is held solid by a small metal screw. The bone will heal over six weeks, when weight bearing can resume again. 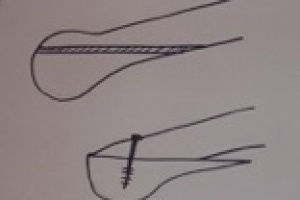 The incision is on the top of the foot, often between two rays when more than one bone needs to be re-set. Surgery is carried out under general anaesthetic, but can be carried out with local anaesthetic injections behind the knee or around the ankle. The injections are normally given while you are asleep for your comfort. They can give good pain relief for the first day after the operation. You can go home the same day in the evening. Bleeding, infection, poor bone healing, poor skin healing, injury to tendons, injury to nerves, recurrence, and a need for further surgery. There is a small risk of blood clots in the legs or lungs (DVT and PE), and there are also risks from anaesthesia – the process of being put to sleep for your operation. The injection behind your knee is given using an ultrasound machine to guide the needle. There is a less than 1% chance of injury to the nerve. General anaesthetic also carries risks. These risks are proportional to your general health. You will need to be assessed for your fitness for surgery and an Anaesthetist will be able to advise you on your individual risk. The rehabilitation will be the same, regardless of which combination of procedures that you have had. You will have had injections to numb your foot so that you are not in pain after the operation. This injection will wear off after 18-24 hours, so you must take regular painkillers so that you are not in severe pain when the injection wears off. Ibuprofen and Diclofenac should not be used for more than a few days after the operation as they can interfere with bone healing. The pain will settle over a few weeks. You may see blood stains on the dressings. This is normal and not a cause for alarm. If blood is dripping from the dressings however, return to hospital. The foot will be swollen as well as sore. You should keep the foot elevated as much as possible for the first two weeks. Keep walking down to a minimum – going to the toilet or for meals. 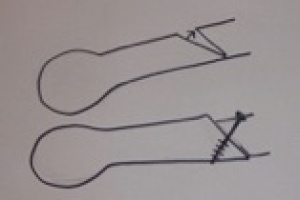 Letting the leg hang down will cause the foot to become more swollen. Most of the swelling will settle within the first few months, but swelling can continue for up to one year. If you are resting on your sofa, keep your foot elevated on the back rest or arm rest. If you are resting in bed, then place a few pillows under the foot to keep it elevated. 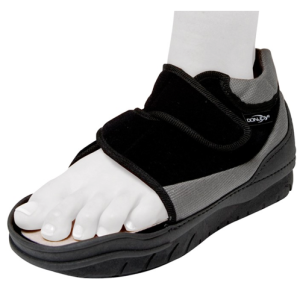 You have been given a special shoe that does not allow you to put weight on the front of the foot. This is because the re-set bones are held together by screws, and putting weight on it can dislodge the screws holding the bone. You should wear this continuously for the first two weeks, including in bed. After that, you should wear it whenever you are walking, even at home. Crutches are for balance only. You should not perform exercises for the toes, but you can draw the alphabet in the air with your foot to keep the ankle and other joints mobile. You will be wearing the special shoe for six weeks, and we will then take an xray. I advise that you do not return to work before this, especially if you are on your feet all day at work. Most people can drive after 8 weeks, if there is no pain. Remember that not everyone is the same, and some people take a longer time to recover from their surgery. Please request a sick note before you leave hospital, if you need one.